Stanley Melbourne Bruce, 1st Viscount Bruce of Melbourne, CH , MC , PC , FRS (15 April 1883 – 25 August 1967) was the eighth Prime Minister of Australia, in office from 1923 to 1929. He made wide-ranging reforms and mounted a comprehensive nation-building program in government, but his controversial handling of industrial relations led to a dramatic defeat at the polls in 1929. Bruce later pursued a long and influential diplomatic career as High Commissioner to the United Kingdom (1933–1945) and chairman of the Food and Agriculture Organization (1946–1951). Federalism was adopted, as a constitutional principle, in Australia on 1 January 1901 – the date upon which the six self-governing Australian Colonies of New South Wales, Queensland, South Australia, Tasmania, Victoria, and Western Australia federated, formally constituting the Commonwealth of Australia. It remains a federation of those six "original States" under the Constitution of Australia. The Australian Federal Police (AFP) is the national and principal federal law enforcement agency of the Australian Government with the unique role of investigating crime and to protect the national security of the Commonwealth of Australia. The AFP is an independent agency of the Department of Home Affairs and is responsible to the Minister for Home Affairs and accountable to the Parliament of Australia. Since October 2014 the Commissioner of the Australian Federal Police has been Andrew Colvin. The House of Lords, also known as the House of Peers, is the upper house of the Parliament of the United Kingdom. Membership is granted, respectively ruled, by appointment, heredity or official function. Like the House of Commons, it meets in the Palace of Westminster. Officially, the full name of the house is the Right Honourable the Lords Spiritual and Temporal of the United Kingdom of Great Britain and Northern Ireland in Parliament assembled. The Ulster Scots, also called Ulster Scots people or, outside the British Isles, Scots-Irish (Scotch-Airisch), are an ethnic group in Ireland, found mostly in the province of Ulster and to a lesser extent in the rest of Ireland. Their ancestors were mostly Protestant Presbyterians Lowland Scottish migrants, the largest numbers coming from Galloway, Lanarkshire, Renfrewshire, Ayrshire and the Scottish Borders, with others coming from further north in the Scottish Lowlands and, to a much lesser extent, from the Highlands. Royal Melbourne Golf Club is a 36-hole golf club in Australia, located in Black Rock, Victoria, a suburb southeast of Melbourne. Its West and East courses are respectively ranked number 1 and 6 in Australia. The West course is ranked in the top-five courses in the world. Founded 128 years ago in 1891, it is Australia's oldest extant and continually existing golf club. Unlike many metropolitan golf venues, The Royal Melbourne Golf Club has a capacity for 15,000 spectators. Money was borrowed from Britain to fund the state's programs and at an unprecedented rate. Over £230 million was extended in loans from the City of London to state and Commonwealth treasuries during the 1920s. A further £140 million arrived through private investment. Bruce's plan for Australian economic development needed a much stronger role for the Commonwealth government than had been traditionally accepted. Both he and Page were "conspicuously national rather than federal in their outlook"  and sought major changes to federal-state relations in order implement their development policy. These heavy-handed tactics drew outrage from the Labor Party, which challenged the Prime Minister to seek approval from the people. This Bruce did, and the elections of 1925 were Australia's first "red scare" election. He campaigned for industrial peace and an increased Commonwealth role in securing it, but also denounced "foreign agitators" and "class war" in appealing for law and order on the waterfront. He openly challenged pre-existing federal arrangements, stating on the campaign trail that Australia "should now consider whether that great historic instrument, the Constitution, meets the needs of to-day in the light of the developments which have taken place". The campaign was a success and the Bruce government was easily re-elected, increasing by 11 seats its majority over a disheartened ALP, whose leader Matthew Charlton was in poor health. The problems of industrial unrest continued to flare up, and the waterfront remained a flashpoint. In a review of the Commonwealth Conciliation and Arbitration Act in 1928, Bruce required industrial courts to consider the economic effects of its awards in addition to the welfare of worker. Immediate problems followed when a new award for waterside workers in 1928 worsened conditions for workers on economic grounds. New industrial action led by the Waterside Workers Federation broke out. In Melbourne these turned to riots, claiming casualties and at least one fatality. Reviving the "red scare" pitch for the 1928 election campaign, Bruce pushed the Transport Workers Act through parliament in response, which gave the executive unprecedented regulatory power in industrial relations. All waterfront workers now required federal licenses, or "dog collars" as they were derisively known, to work. The act allowed the Commonwealth government to effectively control who worked on the docks and nearly destroyed the Waterside Workers Federation, earning the government deep unpopularity among organised labour. As early as 1927 economic indicators were signalling the onset of a recession in Australia. By 1929, the evidence was unavoidable that recession was becoming depression as a resulting of rapidly deteriorating international conditions. In that year, prices for Australian exports fell by nearly a third and GDP had fallen by 10%, with no attendant fall in the cost of living. Australia's debt now stood at £631 million – the interest payments on which were equivalent to nearly half of Australia's export receipts, a situation difficult to sustain even in a positive economic climate. Investors and banks recognised the risk and Australia's credit access was rapidly drying up. Bruce's grand economic development plans had increased the national debt significantly yet had delivered only marginal economic expansion in the short term. Bruce represented Australia at the League of Nations and successfully lobbied for Australia to participate as a member of the League Council from 1933 to 1936. He opposed action against Japan following the invasion of Manchuria in 1933, concerned as to Australia's trading relationship with Japan and the potential future threat it posed to peace in the Pacific. He also attempted to steer the League away from sanctioning member nations, believing it yet lacked the military or economic sway to do so effectively and feared the breakdown of the League – a prospect that loomed after Germany and Japan departed the body in 1933. During the Abyssinia Crisis, Bruce again counselled against partial sanctions, believing them the worst option as they would not stop the Ethiopian invasion and yet would alienate Italy – then a potential ally against a rearming Nazi Germany. He further argued for much greater rearmament efforts in the United Kingdom and France to provide greater military capacity to enforce future decisions by the League. Bruce assumed the presidency of the League of Nations Council in 1936 at the height of the crisis and after the failure of the Hoare–Laval Pact between France, Italy and Britain, but further attempts to forestall the invasion failed. He presided as League Council President during the Rhineland Crisis, although once again attempts to respond to fascist aggression failed. Although this did not shake his conviction in the potential of the League, he saw it doomed to failure without fundamental reforms to its structure and system of sanctions. He was nominated by Turkey to chair the 1936 Montreux Conference, which was far more successful in negotiating international agreement on passage through the Turkish Straits – an issue of particular relevance to Bruce as a veteran of the Gallipoli campaign. Despite the turmoil of his presidency, the League historian F.P. Walters would later describe Bruce as "the best, perhaps, of the many first-rate chairmen who presided over the Council, Conferences, or Committees of the League"  . The Nationalist Party was an Australian political party. 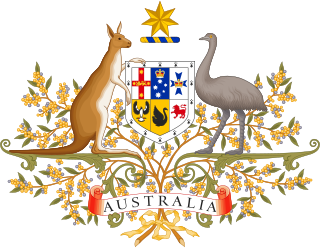 It was formed on 17 February 1917 from a merger between the conservative Commonwealth Liberal Party and the National Labor Party, the latter formed by Prime Minister Billy Hughes and his supporters after the 1916 Labor Party split over World War I conscription. The Nationalist Party was in government until electoral defeat in 1929. From that time it was the main opposition to the Labor Party until it merged with pro-Joseph Lyons Labor defectors to form the United Australia Party (UAP) in 1931. The UAP was the immediate predecessor to the current Liberal Party of Australia, the main centre-right party in Australia. Joseph Aloysius Lyons was an Australian politician who served as the tenth Prime Minister of Australia, in office from 1932 until his death in 1939. He began his career in the Labor Party, but became the founding leader of the United Australia Party (UAP) after the 1931 party split. He had earlier served as Premier of Tasmania from 1923 to 1928. William Morris Hughes, was an Australian politician who served as the seventh Prime Minister of Australia, in office from 1915 to 1923. He is best known for leading the country during World War I, but his influence on national politics spanned several decades. Hughes was a member of federal parliament from Federation in 1901 until his death, the only person to have served for more than 50 years. He represented six political parties during his career, leading five, outlasting four, and being expelled from three. John Curtin was an Australian politician who served as the 14th Prime Minister of Australia, in office from 1941 until his death in 1945. He led the country for the majority of World War II, including all but the last few weeks of the war in the Pacific. He was the only Australian prime minister to come from Western Australia, and was the longest serving leader of the Australian Labor Party until Gough Whitlam. James Henry Scullin was an Australian Labor Party politician and the ninth Prime Minister of Australia. Scullin led Labor to government at the 1929 election. The Wall Street Crash of 1929 transpired just two days after his swearing in, which would herald the beginning of the Great Depression in Australia. 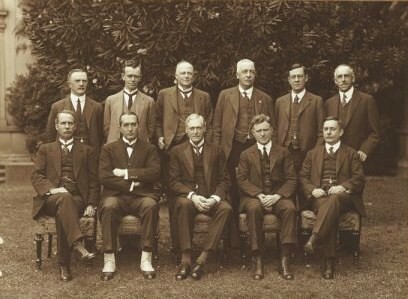 Scullin's administration would soon be overwhelmed by the economic crisis, with interpersonal and policy disagreements causing a three-way split of his party that would bring down the government in late 1931. Despite his chaotic term of office, Scullin remained a leading figure in the Labor movement throughout his lifetime, and served as an éminence grise in various capacities for the party until his retirement in 1949. Sir Joseph Cook, was an Australian politician who served as the sixth Prime Minister of Australia, in office from 1913 to 1914. He was the leader of the Commonwealth Liberal Party from 1913 to 1917, after earlier serving as the leader of the Anti-Socialist Party from 1908 to 1909. The Imperial War Cabinet (IWC) was the British Empire's wartime coordinating body. It met over three sessions, the first from 20 March to 2 May 1917, the second from 11 June to late July 1918, and the third from 20 or 25 November 1918 to early January 1919. Consisting of representatives from Canada, Australia, India, the Dominion of Newfoundland, New Zealand and the United Kingdom, the Cabinet considered many aspects of waging the First World War. It led to the United Kingdom's Dominions being considered more equal to Great Britain. Held concurrently with the cabinet were the Imperial War Conferences of 1917 and 1918. Sir Robert Randolph Garran was an Australian lawyer who became "Australia's first public servant" – the first federal government employee after the federation of the Australian colonies. He served as the departmental secretary of the Attorney-General's Department from 1901 to 1932, and after 1916 also held the position of Solicitor-General of Australia. Sir John Greig Latham GCMG QC was an Australian lawyer, politician, and judge who served as the fifth Chief Justice of Australia, in office from 1935 to 1952. He had earlier served as Attorney-General of Australia under Stanley Bruce and Joseph Lyons, and was Leader of the Opposition from 1929 to 1931 as the final leader of the Nationalist Party. The Statute of Westminster Adoption Act 1942 is an Act of the Australian Parliament that formally adopted sections 2–6 of the Statute of Westminster 1931, an Act of the British Imperial Parliament enabling the total legislative independence of the various self-governing Dominions of the British Empire. The Statute of Westminster further restricted the ability of the Parliament of the United Kingdom to legislate for the Dominions. Federal elections were held in Australia on 12 October 1929. All 75 seats in the House of Representatives were up for election, but there was no Senate election. The election was caused by the defeat of the Bruce-Page Government in the House of Representatives over the Maritime Industries Bill, Bruce having declared that the vote on the bill would constitute a vote of confidence in his government. Australia is a constitutional monarchy whose Sovereign also serves as Monarch of the United Kingdom, New Zealand, Canada and eleven other former dependencies of the United Kingdom including Papua New Guinea, which was formerly a dependency of Australia. These countries operate as independent nations, and are known as Commonwealth realms. The history of the Australian monarchy has involved a shifting relationship with both the distant monarch and also the British government. Australia–Canada relations are the relations between the two Commonwealth realms of Australia and Canada, both former Dominions of the British Empire, with Elizabeth II as monarch. The Imperial Conference of 1923 met in London in the autumn of 1923, the first attended by the new Irish Free State. While named the Imperial Economic Conference, the principal activity concerned the rights of the Dominions in regards to determining their own foreign policy. Ethel Dunlop Bruce, Viscountess Bruce of Melbourne was the wife of Stanley Bruce, who served as Prime Minister of Australia from 1923 to 1929. She was the first prime minister's wife to live at The Lodge. The Waterside Workers' Federation of Australia (WWF) was an Australian trade union that existed from 1902 to 1993. After a period of negotiations between other Australian maritime unions, it was federated in 1902 and first federally registered in 1907; its first general president was Billy Hughes. The Commonwealth Line was a shipping company owned and operated by the Australian federal government between 1916 and 1928. It was officially known as the Commonwealth Government Line of Steamers until 1923, and thereafter as the Australian Commonwealth Line of Steamers. 1 2 Lee, pp. 3–4. 1 2 Lee, pp. 4–5. ↑ Richard D. Burnell (1979). One Hundred and Fifty Years of the Oxford and Cambridge Boat Race: An Official History. Marlow, UK: Precision Press. p. 104. ISBN 978-0-9500638-7-4. 1 2 3 4 5 6 7 8 9 Australian Dictionary of Biography. 1 2 Lee, p. 14. ↑ "Second Supplement". London Gazette (29079): 1823. 19 February 1915. Retrieved 21 August 2013. ↑ Alan Moorehead (2002). Gallipoli. Sydney: Harper Collins. pp. 36–43. ISBN 0-06-093708-4. ↑ "Second Supplement". London Gazette (29460): 1337. 1 February 1916. Retrieved 21 August 2013. ↑ "Second Supplement". London Gazette (29486): 2068. 22 February 1916. Retrieved 21 August 2013. 1 2 Lee, p. 13. ↑ "Third Supplement". London Gazette (30123): 5710. 9 June 1917. 1 2 Lee, p. 17. ↑ "Flinders By-Election: Declaration of Poll". The Argus. 20 May 1918. Retrieved 8 August 2013. ↑ Pearce, George Foster (1951). Carpenter to Cabinet: Thirty-Seven Years of Parliament. London, UK: Hutchinson & Company Limited. p. 156. ↑ "Mr. Bruce and his Critics". The Argus. 30 November 1922. p. 8. ↑ Reid & Forrest, pp. 37–38. ↑ Bridge, Carl (1988). "Page, Sir Earle Christmas Grafton (1880–1961)". Australian Dictionary of Biography . Canberra: Australian National University. Retrieved 19 March 2010. ↑ Page, Earle (1963). Truant Surgeon: The Inside Story of Forty Years of Australian Political Life. Sydney: Angus & Robertson. p. 104. ↑ Crase, Simon (1 May 2008). "ABC Ballarat". Abc.net.au. Retrieved 4 November 2011. ↑ National Archives of Australia, In Office. 1 2 Lee, p. 38. ↑ Roe, Michael (1995). Australia, Britain and Migration, 1915–1940: A Study of Desperate Hopes. Cambridge, UK: Cambridge University Press. pp. 64–83. ISBN 0-521-46507-9. 1 2 Macintyre, p. 168. ↑ Dyster, Barrie; Meredith, David (2012). Australia in the Global Economy : Continuity and Change (Second ed.). New York: Cambridge University Press. pp. 115–117. ISBN 1-107-68383-1. 1 2 "ISSUES OF THE ELECTIONS". The Age (21, 999). Victoria, Australia. 6 October 1925. p. 11. Retrieved 9 December 2016– via National Library of Australia. ↑ Bowen, James; Bowen, Margarita (2002). The Great Barrier Reef: History, Science, Heritage. Cambridge University Press. p. 301. ISBN 0-521-82430-3 . Retrieved 24 January 2008. ↑ "Industrial Problems: Mr Bruce's Address". Morning Bulletin. 20 September 1927. p. 7. ↑ Painter, Martin (1998). Collaborative Federalism: Economic Reform in Australia in the 1990s. Cambridge, UK: Cambridge University Press. pp. 97–98. ISBN 0-521-59071-X. ↑ Federico, Giovanni (2010). "The Growth of World Agricultural Production, 1800–1938" (PDF). Groningen Growth and Development Centre. Retrieved 15 March 2013. 1 2 Cumpston, p. 74. ↑ Sinclair, W.A. (1975). "Economic Development and Fluctuation in Australia in the 1920s". Economic Record. 51 (3): 409–413. doi:10.1111/j.1475-4932.1975.tb00269.x. ↑ Boehm, E.A. (1975). "Economic Development and Fluctuation in Australia in the 1920s: A Reply". Economic Record. 51 (3): 414. doi:10.1111/j.1475-4932.1975.tb00270.x. 1 2 Sawer, pp. 131–132. ↑ "Common Centre, Australian Nation: Mr Bruce Defends Canberra". Brisbane Courier. 31 May 1928. p. 13. ↑ Wigmore, Lionel (1972). 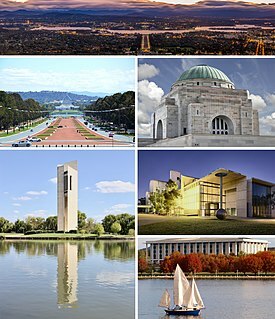 Canberra: History of Australia's National Capital (Revised ed.). Canberra, ACT: Dalton Publishing. p. 101. ISBN 0-909906-06-8. ↑ Meany, Neville (2009). Australia and World Crisis: 1914–1923, Vol. 2. Sydney: Sydney University Press. pp. 508–512. ISBN 1-920899-17-0. ↑ Meany, Neville (2009). Australia and World Crisis: 1914–1923, Vol. 2. Sydney: Sydney University Press. pp. 510–512. ISBN 1-920899-17-0. ↑ "Treaties with Russia: Australia's Position". The Argus. 20 August 1924. p. 19. 1 2 "The Empire "At the Crossroads"". The Register. 4 August 1926. p. 8. ↑ "The Locarno Pact: Its Significance to Australia". The Age. 25 March 1926. p. 15. Retrieved 21 August 2013. ↑ Harkness, D.W. (1969). The Restless Dominion : The Irish Free State and the British Commonwealth of Nations. London, UK: Macmillan. p. 94. ISBN 0-333-06319-8. ↑ "Inter-Imperial Relations". Proceedings of the 1926 Imperial Conference. 1927. pp. 8–18. 1 2 3 4 Frazer, Andrew (2002). "The Federal Conciliation and Arbitration Power: From Cradle to Grave?". Australian Parliamentary Library. Retrieved 18 March 2013. ↑ "Seamen Again Defiant". Sydney Morning Herald. 15 January 1925. p. 9. ↑ Bruce, Stanley (25 October 1925). "Stanley Bruce's Campaign Speech in Dandenong, Victoria". Museum of Australian Democracy. Retrieved 23 March 2013. ↑ "Referendum: An Appeal by the Prime Minister to the Electors". Sydney Morning Herald. 30 August 1926. p. 11. ↑ Bruce, Stanley (8 October 1928). "Stanley Bruce's Campaign Speech in Dandenong, Victoria". Museum of Australian Democracy. Retrieved 23 March 2013. ↑ Bruce, Stanley (18 September 1929). "Stanley Bruce's Campaign Speech in Dandenong, Victoria". Museum of Australian Democracy. Retrieved 23 March 2013. 1 2 Lee, p. 77. 1 2 Robertson, J. R. (1988). "Scullin, James Henry (1876–1953)". Australian Dictionary of Biography. Retrieved 23 March 2013. ↑ Turner, J.W. "Brown, John (1850–1930)". Australian Dictionary of Biography. Retrieved 28 April 2013. ↑ "Mr. Bruce's Policy Speech: "There is Only One Issue"". Sydney Morning Herald. 19 September 1929. p. 13. 1 2 Lee, p. 86. ↑ Commonwealth Parliamentary Debates, Vol. 121, p. 862. ↑ "What has Tariff Meant for Australia". Queensland Times. 14 March 1929. p. 6. 1 2 Souter, pp. 249–252. ↑ Carr, Adam (2008). "1929 House of Representatives: Voting by Constituency, Victoria". Psephos, Adam Carr's Election Archive. Retrieved 2008-05-17. ↑ Coorey, Phillip (13 December 2007). "How Labor's machine won Asian votes for McKew". The Sydney Morning Herald. ↑ "To Serve Australia: Mr Bruce's Ambition". Sydney Morning Herald. 26 October 1929. p. 17. ↑ Carr, Adam (2008). "1931 House of Representatives: Voting by Constituency, Victoria". Psephos, Adam Carr's Election Archive. Retrieved 2008-05-17. ↑ "Mr. Bruce and Australia". Sydney Morning Herald. 6 October 1933. p. 10. ↑ "Mr. Bruce Resigns". The Argus. 7 October 1933. p. 22. Retrieved 21 August 2013. ↑ P.G. Edwards, pp. 39–41. ↑ P.G. Edwards, pp. 40–47. 1 2 Hudson, pp. 74–77. 1 2 Cumpston, pp. 129–130. ↑ Bruce, Stanley (19 September 1935). 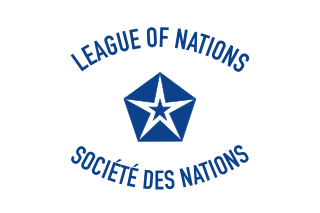 Speech to the Second Committee of the League of Nations (Speech). Geneva. ↑ Clavin, Patricia (2013). Securing the World Economy: The Reinvention of the League of Nations, 1920–1946. Oxford, UK: Oxford University Press. pp. 233–251. ISBN 0-19-957793-5. ↑ Bird, David (1993). The 'Tame Tasmanian': Appeasement and Rearmament in Australia, 1932–1939. Melbourne: A.W.Martin. pp. 262–268. ISBN 1-74097-157-4. ↑ Stewart, Andrew (2008). Empire Lost: Britain, the dominions and the Second World War. London, UK: Bloomsbury Academic. p. 41. ISBN 1-84725-244-3. ↑ P.G. Edwards, p. 52. ↑ Garner, Joe (1978). The Commonwealth Office, 1925–68. London, UK: Heinemann. p. 217. ISBN 0-435-32355-5. 1 2 Cumpston, p. 250. ↑ Food and Agriculture Organization (January 1947). PR.54 (Report). ↑ Food and Agriculture Organization (13–24 June 1949). FAO Council Report (Report). ↑ Food and Agriculture Organization (5–17 April 1948). FAO Council Report (Report). ↑ Food and Agriculture Organization (12–15 November 1951). FAO Council Report (Report). ↑ Debrett's Peerage, Baronetage, Knightage, and Companionage. Kelly's Directories. 1963. p. 199. 1 2 Cumpston, pp. 253–256. ↑ Bruce, Stanley (October 1952). "Notes from Bruce's Address as Chancellor". Chancellor's Papers. Australian National University. Noel Butlin Archives. ↑ "Stanley Melbourne Bruce". National Archives of Australia. Retrieved 21 August 2013. ↑ "Bruce (Suburb)". ACT Planning and Land Authority. Retrieved 21 August 2013. ↑ "Division of Bruce". Australian Electoral Commission. Retrieved 21 August 2013. 1 2 Stirling, pp. 459–460. ↑ "Forgotten Man". Sun Herald. 15 April 1962. p. 2. "Stanley Bruce, Prime Minister of Australia". Canberra: National Archives of Australia . Retrieved 15 March 2013. "Bruce, Stanley Melbourne (1883–1967)". Canberra: Australian Dictionary of Biography . Retrieved 23 December 2012. "S.M. Bruce: The Business Man as Treasurer". Canberra: Treasury of Australia . Retrieved 15 March 2013. Wikimedia Commons has media related to Stanley Bruce .